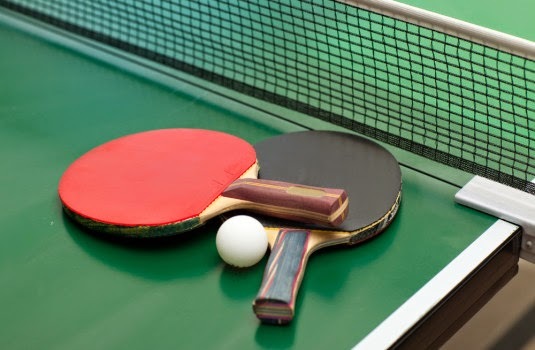 The 23rd annual Decatur Open table tennis tournament is set for Saturday, August 16th at Calhoun Community College. Seventy -four players from across the Southeast will be competing for $1,000 and 21 trophies. The USATT- sanctioned event is divided into different skill levels. Hosted by Calhoun Community College Athletics and the North Alabama Table Tennis Club (nattc.com) this year, the tournament has seen three U.S. Olympians as well as national champions from Malaysia, Togo, West Africa and Indonesia win the tournament. This year's defending champion is Cheng Li, of Mississippi College. Li won the national college men's singles crown in the spring. He will try to be the first player to win back-to-back titles at the Decatur Open. The tournament begins at 9 a.m. in the Carlton Kelley Gymnasium. It is expected to conclude about 7 p.m. Spectator admission is free of charge. Sponsors for the event are Pepsi Cola, Domino's Pizza, Burningtree Country Club, Memphis-Music, BumperNets, Jimmy Smith Jewelers, Robbins Table Tennis, Newgy Robo-Pong and Microtel Inn and Suites. For an entry form and more information, visit nattc.com, click on future events. For more information, contact tournament co-director and referee Michael Wetzel at 256-606-4818. 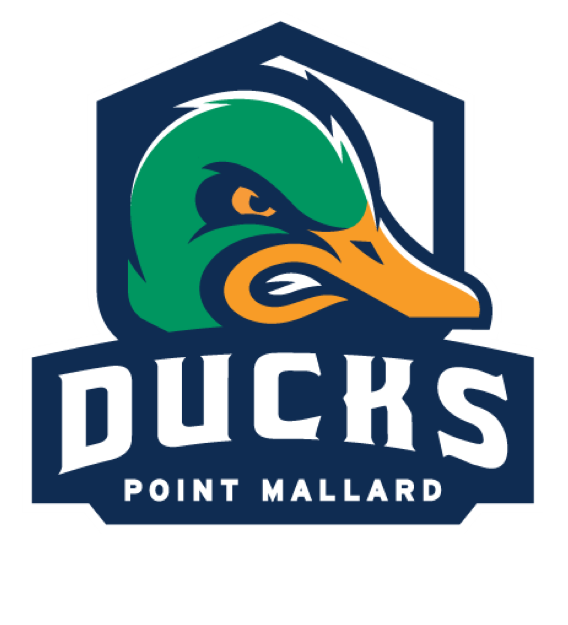 With the 2014 NA3HL draft finished and their inaugural season around the corner, the Point Mallard Ducks are seeking local families to serve as a host home for a player or players. The role of a billet family contributes significantly to the development and advancement of these young men, and the bond formed between billet families and junior players can last a lifetime. Junior hockey ages vary from 16 to 20 years old. For younger players still in high school, it is critical to provide a safe and sound home. These players make the sacrifice to move away from home for most of the year to pursue their hockey dreams, and having a good family host for these young student-athletes is a critical part of their development. Players will live with their billet family for the eight months they are in Decatur playing for the Ducks, from late August through March. Many NHL players maintain close relationships with their billet families and credit them with helping them achieve their hockey dreams. Billet families must provide a separate bedroom and provide healthy, wholesome meals. Billet families are compensated $295 per month along with 2 season tickets for every player. Players provide their own transportation and phones. They will enter the billet family’s home with the utmost respect and appreciation and will follow all house rules. The Point Mallard Ducks program has zero tolerance for negative behavior off the ice. Anyone interested in serving as a billet family should contact Ducks’ Housing and Hockey Coordinator, Terri Mashburn at tmashburn@totalpackagehockey.com or call 256.341.4913. Additional information may be obtained from the Point Mallard Ducks’ website at www.pointmallardducks.com or Facebook page at www.facebook.com/pointmallardducks or on Twitter at www.twitter.com/PM_ducks. The Point Mallard Ducks, Alabama’s first and only junior A hockey team, is a member of the North American 3 Hockey League (NA3HL), one of six USA Hockey-sanctioned Tier III Junior Leagues. The team plays and practices in the Point Mallard Ice Complex located in Decatur, Alabama. For more information, visit www.pointmallardducks.com. 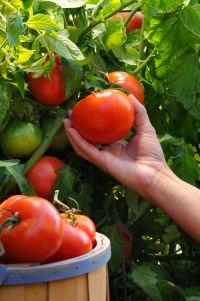 Nothing says summer more than a fresh tomato picked from the vine, and in celebration free tomato sandwiches will be served during the annual Tomato Sandwich Day Saturday, July 26, 2014, at the Morgan County-Decatur Farmers Market. In addition to an abundance of fresh fruit and vegetables for sale, Chef Jake Reed of Albany Bistro will be demonstrating and sharing cooking tips using fresh heirloom tomatoes. Sandwiches complete with white bread and mayonnaise will be given away from 9 a.m. to 1 p.m. or until supplies run out. Albany Bistro Chef Jake Reed will host demonstrations featuring heirloom tomatoes. The first demonstration is set for 10 a.m. with the second one following at 11 a.m. Free samples will be provided following each demonstration. In addition to the sandwiches, free Pepsi-Cola products will be served and home-baked goods, flowering plants, and other locally grown fruit and vegetables, such as watermelon, peaches, cucumbers, peas, okra, and squash will be available to purchase. From 9 a.m. to noon, a Master Gardener will be on hand to answer gardening questions. The expert can help in identifying plants, providing information on soil testing, offering plant recommendations and assisting with pest management issues. The Morgan County-Decatur Farmers Market, located at 211 First Avenue SE in Decatur, also celebrates Watermelon Day on August 16th. For more information on Tomato Sandwich Day, call Manager Burl Slaton at 256.476.5595. For more information on the Morgan County-Decatur Farmers Market, visit them online on Facebook or at www.decaturfarmersmarket.org. Downtown Decatur’s 3rd Friday will hit the streets this coming Friday, July 18th, and from 5 to 9 p.m., the downtown area will be filled with dozens of artists and crafters, live bands, and outdoor cafés providing an evening of free family fun. Stretching from Second Avenue to Bank Street, the monthly celebration invites everyone to take a leisurely stroll through the streets and enjoy live entertainment in downtown Decatur. The 3rd Friday celebration gets underway at 5 p.m. As festivalgoers peruse the many classic and antique cars displayed on Second Avenue, some of the area’s best musicians will provide hours of entertainment. Slated to perform on the Main Stage, located on Bank Street from 6 to 8 p.m. is local favorite Jeff Whitlow and the Old Barn Band. Additional performers include Tim Cannon (by Tallulah’s), Kim Stone (by Bank Street Green Food Court), the Morgan County Dulcimer Association (on Bank Street), Mad Hatters (by The Antique Basket), Kevin Teague and Shawn Ferguson (in Casa Grande Park) and Jason Crow (by Emiron Music). Moe’s Original Bar-B-Que will host the Wheelers beginning at 9:15 p.m. and Julian Carter is the featured entertainment at Simp McGhee’s from 6:30 p.m. until 9:30 p.m.
Bank Street Players will perform songs from their upcoming show, “Smoke on the Mountain” on Second Avenue and Bank Street. Festivalgoers can cool off with a free snow cone from the Point Mallard Ducks Junior A Hockey Team and learn more about this new form of entertainment in Decatur. Season tickets will be available to purchase while they are still available. A complimentary VIP t-shirt will be given to current season ticket holders. The Volunteer Center will kick off its Ducky Derby and the Amazing Duck Race at this month’s 3rd Friday. Teams will be participating in the Amazing Duck Race, a footrace completing mental and light physical challenges at different locations throughout the downtown area. Ducks will be drawn from the fountain at the Old State Bank at the end of the Amazing Duck Race. Prizes include a chance to win $100,000 or one of 20 other prizes. For more information, visit www.vcomc.org/DuckyDerby or call 256.355.8628. There will be plenty of hands-on fun for children throughout the evening including a Kids Zone hosted by Bank Independent in the 100 block of Second Avenue (across from Bank Independent) and the Carnegie Visual Arts Center will offer activities and a chalk art contest in the 700 block of Bank Street. The Chalk Art Challenge will let students create works of art with one box of sidewalk chalk per artist. The finished drawings will be judged with the winners receiving gift certificates from downtown stores and restaurants. Beautiful Edge-A Paul Mitchell Focus Salon will offer red and blue hair extensions under the Princess Theatre marquee from 5 to 7 p.m. Local artist Lynn Lawrence will be doing a live Bob Ross-style painting demonstration at How Bazaar. The Alabama Center for the Arts will host Pop Goes the Artist, will have a Kids Art Camp Tent and will offer free tours of the facility. The Old State Bank will also offer free tours until 7 p.m.
Who can eat the most hot dogs? 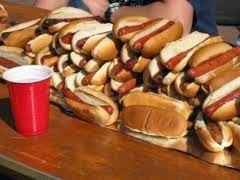 Downtown Dawgs will host their annual hot dog eating contest in Jones Park at 7 p.m. Registration is required at the restaurant. The downtown area boasts an eclectic mix of restaurants and a variety of locally owned boutiques line the streets offering plenty of dining and shopping opportunities for festivalgoers. A food court on Bank Street will provide a convenient location to grab a bite to eat or cool off with a beverage from Ingalls Entertainment, Bank Street Green, Downtown Dawgs, The Big Easy, and Chuck Wagon. Along 2nd Avenue, craft vendors will be selling handmade items and The Market on Bank Street will feature artists, handmade goods and locally grown fresh produce. Store specials, giveaways, and discounts will be offered at select merchants. The Cottage House will provide a cool water station for any dogs attending and The Cupboard will have free samples of Honeypie Bakery, Clover Coffee, and Jala Jala Foods for festivalgoers to try. The Paper Chase, along with Junior League of Morgan County, will host Decatur native and author Jen Doll for a signing and reading of her new book Save the Date: The Occasional Mortifications of a Serial Wedding Guest. MCATS will provide transportation between Bank Street and Second Avenue for $1 per person, per ride. Pickup locations are at the Alabama Center for the Arts parking lot on Second Avenue and beside Tammy Eddy Antiques and Interiors on Bank Street. Participating streets in 3rd Fridays include 2nd Avenue, Bank, Market, Moulton, Grant, and Johnston streets. Hours are 5 to 9 p.m. Admission is free. 3rd Friday Downtown Decatur is organized by the members of the Downtown Decatur Merchants and Business Association, including Bank Independent, Bank Street Art & Antiques, Beautiful Edge-A Paul Mitchell Focus Salon, Chenault Studios & Bank Street Green, Decatur Downtown Redevelopment Authority, Decatur Morgan County Chamber of Commerce, Decatur-Morgan County Convention and Visitors Bureau, Decatur Morgan County Farmer’s Market, Ingalls Harbor, King Insurance Agency, Mellow Mushroom, Memi’s Progress Bank, Simp McGhee’s Stovall Marks Insurance, The Cupboard, and The Paper Chase. The Downtown Merchants Association wishes to thank the City of Decatur Parks and Recreation Department for the tremendous support they provide to the event as an in-kind sponsor. Presenting sponsor is Budweiser. Diamond Sponsor is Decatur Downtown Redevelopment Authority. Gold Sponsors include Bank Independent, BP, Decatur/Morgan County Convention and Visitors Bureau, Decatur-Morgan County Chamber of Commerce, Progress Bank, and Morgan County Commission. Silver Sponsors are Nucor Steel and 3M. Bronze Sponsors are Renasant Bank, Stovall-Marks Insurance, Beautiful Edge-A Paul Mitchell Focus Salon, and King Insurance Agency. For more information, call Ashley Ashwander at 256.355.8993 or visit 3rd Friday’s Facebook page for the latest information. The second Saturday of each month is about to get a little sweeter in downtown Hartselle as merchants throw out the welcome mat and celebrate with north Alabama’s favorite beverage. Sweet Tea Saturday is held the second Saturday of each month and offers locals and visitors an opportunity to enjoy Hartselle with entertainment and special offers from local merchants while sipping on sweet tea. Set for July 12, Sweet Tea Saturday gets underway at 10 a.m. This month’s celebration continues the all-American fun that comes from Independence Day. With a theme of “Hot Dogs, Apple Pie, and Ford,” the downtown area will be showing its patriotic side. Hot dogs will be served in the new parking lot on Main Street West. Locals and visitors are invited to grab a bite to eat and enjoy perusing a display of cars and trucks from Eddie Preuitt Ford. Fried apple pies will be available to purchase from Pig Stand Barbeque. The medical unit will be in the new parking lot as well and classic cars will be on display at Town & Country Cleaners in the Hartselle Plaza Shopping Center. Hartselle is filled with a variety of restaurants and locally owned merchants and boutiques that will have special offers during the daylong event. 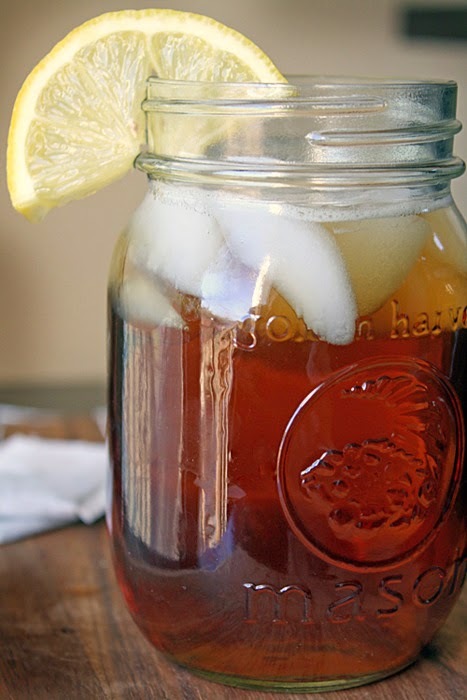 While shopping for special treasures or simply enjoying the day with friends and family, cool off with a complimentary glass of sweet tea provided by Hartselle merchants. For more information on Sweet Tea Saturday, call Randy Garrison at 256.773.6566 or visit their Facebook page “Sweet Tea Saturday in Hartselle, Alabama” for the latest information. The American Bass Anglers, who conducts the largest and most prestigious tournament trail for weekend anglers, is bringing its American Couples Series to the River City on July 12, 2014. Couples from across north Alabama will compete for cash prizes and to earn a spot in the championship to be held in September. The American Couples Series feature teams of two anglers – one man and one woman, not necessarily married, related or in a relationship, competing against other teams for cash prizes. During the tournament, each team may weigh in up to five bass, regardless of which team member catches them. At the end of the season, the best teams from divisions across the country gather to compete in an annual championship to be held on Lake Eufaula in September. Ingalls Harbor, located at 802 Wilson Street NW in Decatur, will host the takeoff and weigh-in. Takeoff is set for safe daylight with the tournament wrapping up at 3 p.m. Takeoff and weigh-in are free and open to the public. For more information, call Tournament Director John Brannen at 256.679.8278 or visit www.americanbassanglers.com/Couples/.